The Madras White Buffalo football team wins homecoming game 30-14 against Yamhill-Carlton. 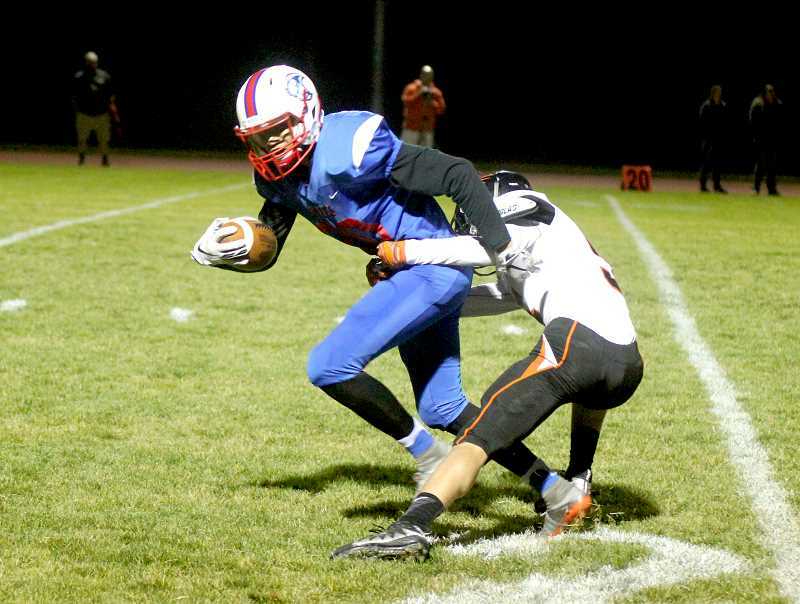 The Madras football program got back into the win column Friday, beating Yamhill-Carlton 30-14. The Buffalos changed a few things to help get the Homecoming win. Yamhill-Carlton started the game with a good offensive drive. They used a balanced, run, pass offensive and drove to the Madras 20-yard line. The Tigers went for it on fourth-and-7 and scored a touchdown. Yamhill-Carlton quarterback Jamie Garcia found tight end Hunter Stephenson in the end zone for a score. The Tigers would miss the extra point and take a 6-0 lead over the Buffs. "When the game started, I was a little hesitant," head coach Kurt Taylor said. "I would love to start a game where we just go, but the team still did exactly what we asked. They bit down, fought, were resilient and it is fun to watch them — even if my blood pressure is higher than I would like it to be." "After last week's loss, as a staff we went into Sunday night grinding," Taylor said. "We worked, put in a lot of hours and came into Monday with a different practice plan, watched more film and we taught. This team is wanting to learn and I love it." The White Buffalos lined up for offense and had new quarterback Robert Pacheco start under center. Madras went three-and-out to start the game and punted the ball back to the Tigers. "I was a little nervous at the beginning of the game, but I had to come out and be a leader," Pacheco said. "I knew that if I came out here and was a leader, did what we could do, the outcome would be in our odds." This was Pacheco's first game back from injury. He went down with a concussion during the team's 34-12 win over La Pine Sept. 7, and had missed the two previous games. "We started off slow and I knew it was because the team lost twice, but we needed to come out here, ball out and get our confidence back," Pacheco said. The Tigers had small runs and a couple screen passes to get past midfield. Yamhill-Carlton went for it on fourth down and completed a screen pass to the wide receiver, who got the first for the Tigers. They drove the ball down to the Madras 10-yard line and went for it on another fourth down. 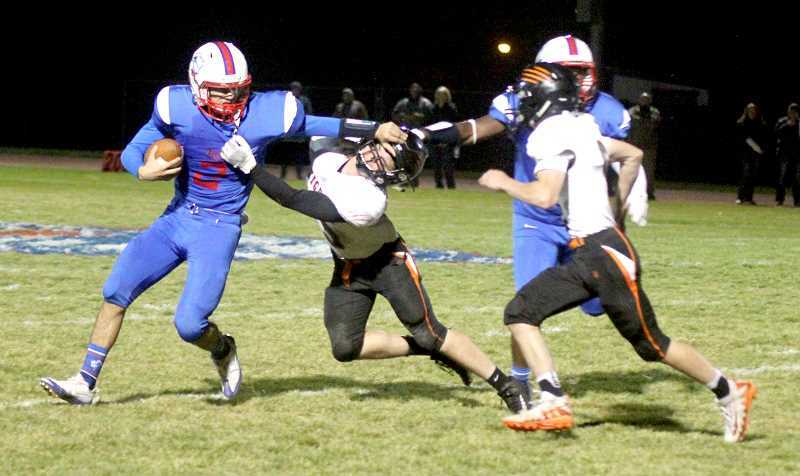 On fourth-and-4, Madras stuffed the Yamhill-Carlton run and their offense took the field. The Buffs started from their own 10-yard line and drove the ball all the way down the field for a score. Pacheco ran for a 14-yard gain and later found Nathan Stout for a 12-yard gain. Wide receiver Byron Patt caught a screen pass from Pacheco for a 14-yard gain and Pacheco found Patt again on a streak for 20 yards. "Running the ball is really second nature to me," Pacheco said. "When things break down in practice, I usually run the ball and try and get positive yards. I still want to make my receivers happy before I make myself happy though." "To be able to move the pocket allows for two different scenarios," Taylor said. "He can run out of the pocket and get positive yards 90 percent of the time or he can move the pocket, set up a launching pad and throw the ball down the field." In the red zone, Pacheco hit Patt in stride on a slant pattern for a 13-yard touchdown. The PAT was made by Kaegan Prevett and the Buffs took a 7-6 lead. 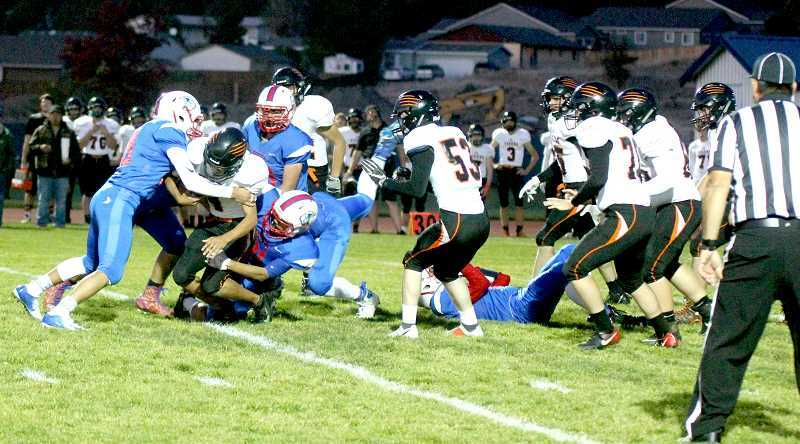 Madras stopped Yamhill-Carlton and on offense they pushed down the field, setting up a field goal. Madras kicker Prevett sailed the ball through the uprights for a 30-yard field goal. Madras took a 10-6 lead in the second quarter. On defense, Wesley Beamer sacked the Yamhill-Carlton quarterback on third-and-4, forcing the Tigers to punt. A pair of Pacheco keepers gained around 20 yards, and a couple of 6-yard runs by Victor Torres moved the ball into scoring position. Pacheco hit Patt on a deep 25-yard touchdown catch on their second TD connection of the night. Prevett's extra point was good and the White Buffalos took a 17-6 lead at halftime. "The touchdown passes were gametime feel," Pacheco said. "I knew they were not pressing too hard and knew the coverages and exactly when to throw the ball." "Man, our O-line," he said. "Our O-line! Those are some good boys." The Tigers began their offensive drive after stopping the Buffs and forcing a punt at the start of the second half. Yamhill-Carlton passed the ball for several good gains to the Madras 5-yard line. On third-and-goal, defensive pressure by Kobey Jorgensen forced Yamhill-Carlton quarterback Garcia to throw the ball away while being tackled. Garcia threw the ball in the ground with no receivers around, causing an intentional grounding penalty. The Tigers would decide to go for it on fourth-and-goal at the Madras 14-yard line. They completed a hook and ladder. The pass was caught by a Yamhill-Carlton receiver, who tossed it back to the Tiger running back for a good gain, but he was stopped short of the goal line. The Buffs took the ball back at their own 4-yard line. Madras running back Treyvon Easterling ran the ball for a 15-yard gain to start the drive. A few plays later, Torres ran for an 80-yard touchdown, but a block in the back penalty took the TD away. The refs placed the ball at the spot of the foul, which was the Tiger 45-yard line. The Buffs went for it on fourth-and-1, running a QB sneak. Pacheco gained enough for the first down and kept the drive alive. After the first down, Pacheco threw a deep ball to Patt for an incomplete pass, but the Tigers were called for defensive pass interference, giving the Buffs a first down at the 15-yard line. "It changed our offense a bunch," he said. "We became really three-dimensional and it worked out really well." Torres ran the ball to the outside for a 15-yard touchdown run and Prevett made the PAT, giving the Buffs a 24-6 lead. The Tigers offense needed to score quickly if they wanted to make a comeback, so they went on a heavy passing attack. Yamhill-Carlton found some success through the air before Garcia was picked off by Madras cornerback Erik Boynton. With a big lead, the Buffs ran the ball, keeping the game clock going. Pacheco ran the ball for a 14-yard gain and Madras gave the ball to Easterling, who ran for a 5-yard run and a 7-yard run before finding the end zone on a 16-yard touchdown run up the middle. The PAT was blocked and Madras took a 30-6 lead in the fourth quarter. "I was not going to stop until I got my touchdown," Easterling said. "I wanted it. I wanted it." Yamhill-Carlton was again trying to pass on the White Buffs before Liam White, of Madras, caught an interception and ran for 20 yards before being tackled. The Tigers moved the ball well on their next drive, finding success with some screen passes. They went down the field and Decker Richmond, of Yamhill-Carlton, caught a touchdown pass from Garcia. They also connected on a two-point conversion and cut the Madras lead down to 30-14. Madras ran a couple more times before kneeling the ball and ending the game with a 30-14 victory. Madras finished with 325 total yards of offense. Pacheco finished the game 8-for-16 with 120 yards passing and two touchdowns. He also ran the ball for 49 yards on 13 attempts. "Robert is a great athlete and does things that are downright amazing sometimes." Taylor said. "He gives us a dynamic back there that helps the team run that RPO (run, pass, option) style and gives us another read with a QB running the ball." "Robert is the kind of the guy that is a gamer," he said. "A true gamer. When he has the ball, you are holding your breath because he can throw a touchdown, make a read to handoff the ball to someone that can run a touchdown, or he can run a touchdown. That is special and that is why he is there." "He is one hell of a leader and the kids respond to him in a way that enables us to be the best team we can be," he said. Easterling led the team in rushing yards with 83 yards on 12 attempts and a touchdown. Torres was behind him with 51 rushing yards on eight attempts and a touchdown. Patt led the team in receiving yards with 95 on five catches and two touchdowns. Nathan Stout caught the ball two times for 23 yards. Defensively, the Buffs held the Tigers to 288 yards of total offense, 189 yards in the air and 99 yards on the ground. Yamhill-Carlton was 4-for-14 on third down attempts and threw three interceptions. Torres, Kody Zemke and Agustin Padraza led the team in tackles with four each. "This game was really important," Easterling said. "We have not won a league game in six years, since 2012. Those two losses kind of set us back, so we knew we had to come out strong, put our foot on their throats and don't stop." "This game was huge," he said. "This game meant a ton. We wrote on the whiteboard that we want to start every week 1-0. League play is a new season. We want that playoff spot and need to go 1-0 each week. Earn it." Madras (3-2) has an away game against Blanchet Catholic (0-5) Oct. 5, at 7:30 p.m.